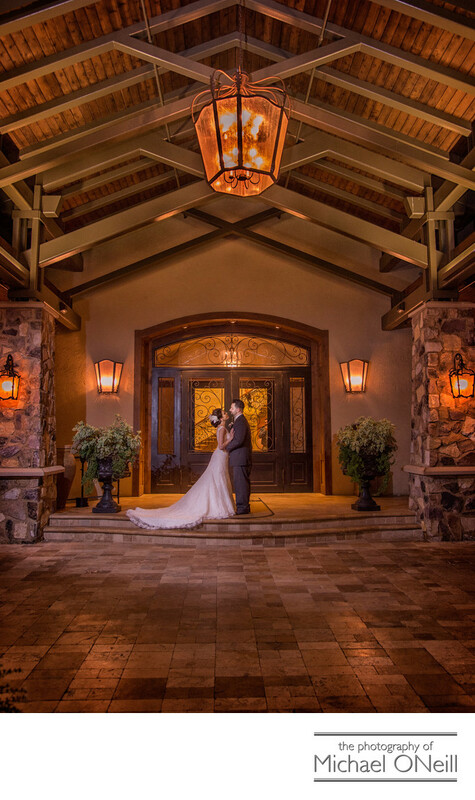 This amazing wedding picture of the bride and groom was taken at Larkfield Manor in East Northport, NY. My studio is located literally three minutes from this awesome venue and I have a great deal of experience working there. Elsewhere on this web site you will find other fine wedding photographs created at Larkfield Manor. Some taken in the elegant lobby area with it’s grand staircase. This one in front of the majestic entryway. A few taken in the perfectly manicured gardens and another under the gazebo in the patio and garden area off the main cocktail reception room. I love the feel of this outdoor photograph at night, the gorgeous stone and wood work illuminated by the warm exterior lighting and chandelier. My studio has been located on Larkfield Road in East Northport, NY since 1984...almost as long as Larkfield Manor has. I can’t even remember all the weddings I’ve photographed here over the years. Probably more than 150 making me one of the most experienced Larkfield Manor wedding photographers out there. If you are planning a Larkfield Manor wedding give me a call. I’d love to show you the many great images I’ve made there and discuss the possibility of creating some for you on your wedding day.